Learners permit at age 15 and a formal test required for a license at 16. This kind of law would prevent deaths of young children who are taken by their parents to firing ranges to “try out” weapons. Or parents letting their kids shoot a gun in any situation. Just as a nine-year old isn’t allowed to drive a car, so they shouldn’t be allowed to fire a 9 mm Micro Uzi. It is doubtful children firing automatic weapons was the intention of our founding fathers when they crafted the second amendment. Hunting is no exception. Kids can’t drive a car or truck for any purpose and nor should they be shooting a firearm. *This is an updated version. I added different classes of licenses because of great suggestions from the people of Twitter. I meant to include insurance, but it slipped my mind. Thanks Amy for mentioning it in the comments! Comments are now closed due to the number of particularly hateful comments and insults directed towards myself and immigrants. What about requiring comprehensive liability insurance to be purchased for each weapon before it can be taken off of gun shop premises, just like an auto? It would be up to the insurance companies to determine how much of a risk each individual might be before granting them equitable liability coverage (does the person have good credit? Are they responsible? What is the primary use of the weapon going to be? How old are they? Would others have access to the gun? Small children? Family members with mental health issues? Convicted felons?). Require the insurance to be maintained for the entire term of ownership, just like a car. Get the insurance companies involved and make it that much more expensive, plus force the purchaser to truly evaluate what their responsibilities might be, including financially, before they can walk away with a deadly weapon, and we might be able to limit some of those weapons getting into the wrong hands to begin with. The guns that get into the wrong hands don’t often get there legally. You can pass laws, require insurance, and make it a pain and evil people are still going to commit evil acts. All you will do is make sure law abiding citizens who have a constitutional right to keep and bear arms will be defenseless. Where in the constitution does it say you have the right to drive? States try to require I.D. to vote and people claim it is a form of poll tax and you can’t tax a right. Well then you can’t tax firearms or use cost to prohibit ownership because you will be depriving the poor of the ability to exercise their second amendment RIGHT.. I think this is a bit of a masked-man fallacy. It’s this idea that because it takes a human to actually kill, the tool is irrelevant. I disagree. A human can kill with a car, yes. It’s generally not intentional (and in fact when someone is killed with a car, it’s referred to with terms like, “accident” or “fatality” or “vehicular manslaughter” because it’s not the car is supposed to be used). A human can also kill with a lamp or a baseball bat. But none of these things are tools intended to be used for murder, and that is what a gun is. A gun is a tooled that was conceived and designed to kill. It is a tool that over the years has been honed to kill more effectively. That’s it’s point. Yes, humans would kill with or without guns — but damn, do guns make it so much easier. A reasoned argument but one with multiple flaws. The first being that gun ownership is a constitutionally garunteed right, while operating a motor vehicle is a government sanctioned privilage. The founders of our country believed that owning a weapon was a basic human right, and a basic social reponsibility, not to be subject to the whims of government intervention. If you want to consider what similar requirements would do to, say, freedom of speech, the possibilities for abuse would be astounding. The constitution says nothing about minors firing weapons nor price nor anything I mentioned. None of these ideas would impinge upon the 2nd Amendment in any way. What other constitutional/human rights would you like to butcher on the altar of fear and ignorance? The founders of our Constitution had no inkling as to how powerful an armed self-interest group could become. It’s highly doubtful that many of our country’s founders would consider the NRA to be socially responsible. You make good points. But I’d also say that problematically, we’ve moved away from the founders’ society. They drafted a great document, and one that worked within their time. But our society and world evolved, and the document didn’t. Related in sentiment: more than half of the founders also believed (though not officially on paper) in slavery and owned slaves. But we’ve evolved past that one. So it’s not a far stretch to say that we need to revisit old law and documents and revise them for our modern society. Does our Constitution not grant us the right to travel from place to place? If that is the case then we are guaranteed the right to purchase a tool to help us move from place to place. There are rights that we were granted like this that are not excitedly defined because they were common sense rights. The Constitution did not need to include in the bill of rights the right to own a horse or a cow. Thus we have the 9th Amendment. Voting is a constitutionally “garunteed” right as well and all the things you apply to that. Yet regulations and registration are considered appropriate. Yet many of the same who argue for 2nd amendment rights are eager to pass regulations that clearly will err on the side of not allowing voting rights to ensure a non-existent potential problem of voter fraud can occur. The Supreme Court has ruled much of that constitutional. You’re a doctor, not a gun expert. Learner’s permit/license: While in general I support the idea of a gun license you’re focusing on a *VERY* small issue here–the number of kids harmed while being directly supervised using a gun is tiny. License renewal: What do you normally do when you renew your driver’s license? Pay your money, get your eyes tested and get a new license. The only meaningful part of that is the eye test. Otherwise it’s to keep a current photo on the license and to make old ones eventually expire, a security measure as it also doubles as ID. Registration: We register cars because they’re otherwise rather anonymous. There is no meaningful equivalent with guns (you could test a bullet but they’re not like fingerprints, over time they will change and they can be deliberately changed by those with ill intent.) so there’s no real gain from registration. On the other hand history shows that all too often it’s a prelude to confiscation. Safety testing: How often have you heard of someone harmed by a gun that is worn to the point of being unsafe? Ammo tax: Here you really show you don’t know what you’re talking about. You can’t tax ammo based on the magazine size because it doesn’t come in a magazine size. Furthermore, the harm caused by ammo is if anything inversely related to how much one buys–the heavy users rarely harm anyone. The criminals buy very little. 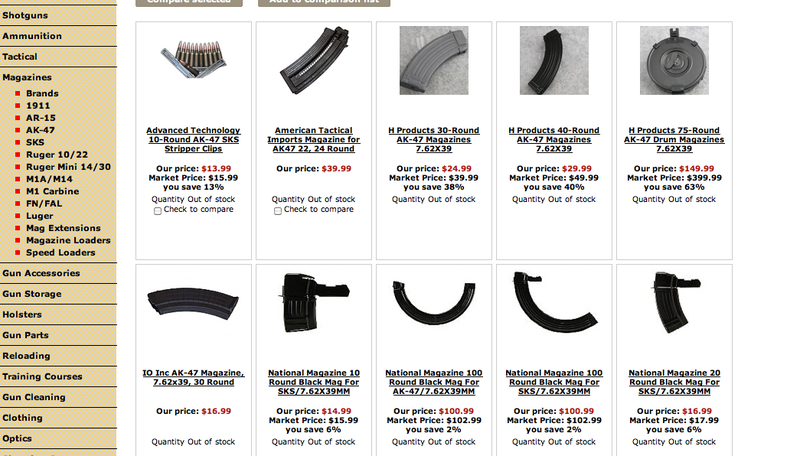 Online ammo sales: You think the criminals are going to want ammo shipped to their home? Especially since an awful lot of them can’t legally possess it anyway. This will do nothing about misuse, just raise the price for legitimate users. Trigger locks: You’re focusing on one solution to the problem rather than on addressing the problem. That would be like mandating that every woman between puberty and menopause must be prescribed the birth control pill. The real issue is secure storage of firearms. Locked boxes serve perfectly well here. Requiring more of gun manufacturers: The devil is in the details. What should they do? What can they do? You updated while I was writing so I missed one point: Classes of licenses. In other words, those people (poor, minority, etc) who are being disenfranchised through voter ID laws are by your proposal also being disarmed? Brilliant! You said we should “tax ammunition” but then start talking about the prices of magazines. Do you realize they aren’t the same thing? Magazines are the metal cases that hold the ammunition. The ammunition is purchased separately. While most of your points are very good, taxing ammunition to raise money for gun safety classes is a very poor and purposeless idea. Every time my husband goes to the range he spends anywhere from $50 to $100 on ammunition, which will last him maybe 20-30 minutes of target practice. It is already so pricey he can only afford to go every few months, I can only imagine how impractical it would be if they started “heavily” taxing it as you suggest. All the tax would do is cause many, many ranges and other such places to go out of business while doing little or nothing for crime prevention. Criminals don’t legally purchase ammunition anyway, so taxing it wouldn’t deter them at all. If money needs to be raised for gun safety classes, then simply mandate said safety classes and charge an appropriate fee for them. Taxing every bullet will only hurt the economy, ruin many small businesses and jobs, and make it so that responsible gun owners won’t be able to practice safe and accurate shooting and gun handling nearly as often, something that actually DOES help prevent gun accidents! The Constitution says you have a right to free speech,but nowhere does it say you have to practice it in public,so control what and when is said by a tax on words.No longer have to endure 2 hour presentations at seminars!This makes just as much sense as the above diatribe. Doc you need to stick with what you know. Several good points but most are naïve at best. And the cost to govn. would be humongous. So should illegal immigrants get a free ride to firearm ownership, as they get a free ride to a drivers license here in California? Dr. Gunter, you make some interesting (not altogether valid) points. The major problem, though, is that driving is not a constitutional right while bearing arms is a constitutional right. 1. Move to another country where guns are banned. Mexico would be a great one. 2. Use the amendment process. That’s why the Constitution is such a durable document. I don’t think you have the votes to do it, especially with more and more purchases being made every day. 3. Deal with it. Continue to post well-meaning commentaries online which, let’s be honest, are as valid as they are original. Incidentally… do you have a license to engage in your 1st Amendment Rights? Did you get a separate license to run a laptop? No? That’s because it is a right. In fact, I don’t see anything saying that your 1st Amendment Rights cannot be infringed, unlike the 2nd. Everyone here that says the Constitution grants rights are sorely mis-informed. The Constitution grants nothing. Our rights are “inalienable” and are granted to us by our “creator” (who/what ever you may believe that to be). What the Constitution does is LIMIT what government can do. All most all the licensing and registration we have today is “US” either giving up our rights or the government “taking” them away. The vast majority of our inalienable rights are not spelled out in the Constitution or the Bill of Rights. Only those deemed necessary to insure the freedom of people are enumerated but it is not all encompassing. In short WE THE PEOPLE hold the power. Not the government. Ask yourself why you need to get a “license” or “permit” for things such as transportation, marriage, assembly. Ask yourself why public universities restrict the RIGHT to “Free Speech” on campuses. Think before you give away any more of YOUR rights and before you take away the RIGHTS of your fellow citizens. Permits and license are only required if someone was to take a vehicle and drive on public streets. No such requirement needed if someone was to drive on private property such as a private race track. Since most gun owners keep their guns at home or shoot them on private ranges, your analogy fails to recognize public vs private places. Most of the country, if a person wishes to bring their gun (CCW) into public places, the requirements are a lot more difficult already: background check, 21 years +, clean record, blah blah blah. Similar to the above arguments, most states already have CCW renewal requirements. If you own a gun and only use it on private land, no need for renewal since cars on private land/track do not reed renewal either. Again, similar to the previous 2 arguments: cars/guns not intended to be used on public streets do not need registration. Cars damages public property such as roads and tax from cars are used to maintain such roads. Owning a gun does not damage any public property, and therefore doesnt need to be tax for nothing needs to be maintained. Again, only applies to cars used on public roads. Should CCW require some sort of insurance? I would like that idea. It should cover my legal/civil court fees if I ever have to use my gun in self defense! Not really safety testing, but SMOG testing. Smog harms the environment and therefor cars that are on public roads needs to be tested in order to provide some security that it wont pollute too much. Guns dont pollute or harm the environment. Not sure where you get you info from, all i have been able to find is that tax is about 50 cents per gallon which equals about 10-15%. Sales tax in most states is already 9-15%. I dont see how gasoline is so “heavily” taxed. Most/all carriers dont ship gasoline because it is a hazardous material. Ammo is safe as long as it is shipped via ground. All laws regulating the transport and the distribution of gasoline is there as a safety factor due to the nature of the material. Laws require the car manufacturers to implement locks into their car; there are no laws requiring drivers/users to use such locks. On the same note, a lot of gun manufacturers already provide a cable lock with most firearms. Whether or not a user decide to use it, its up to them; though it would be a good idea to use a safe instead. Cars and guns kill people in the exact same manner: because someone did something stupid. A car by itself isnt going to start up on its own and run someone over out of its own will; at the same time, a gun will not shoot anyone on its own either. There isnt such a thing as “accidental shooting”, guns will not shoot anyone on its own, period. However, there is plenty of “negligent discharge” by the user because he/she negligently pulled the trigger when he/she wasnt suppose to; the gun will only fire if the trigger is pulled, whether on purpose or not. There are plenty of safety mechanisms implemented into most modern firearms. However, no one has yet to invent something to prevent stupidity for irresponsible drivers and gun owners. Dr. Gunter, I appreciate the thought you have obviously put into this article, but you really should educate yourself about firearms if you plan to comment on them. Just as a gasoline can is not full of gas when you buy it at the hardware store, an ammunition magazine is not loaded with cartridges when purchased. Magazines are not disposable items like pregnancy test kits. You state that requiring firearm registration would create government jobs, but fail to take account of the businesses that would be affected and jobs lost should online ammunition sales be banned. I am sure you do not realize the large number of calibers and types of ammunition there are. Many are obscure and not in common use, or specialized such as lead-free ammunition required for hunting in certain areas. These are not generally available at the local Wal Mart or sporting goods store. Many online vendors specialize in supplying this ammunition and would be forced to close if they were unable to ship it. Just as a vintage car collector might search the Internet for parts for his vehicles, owners of antique and specialty firearms buy parts and ammunition online. 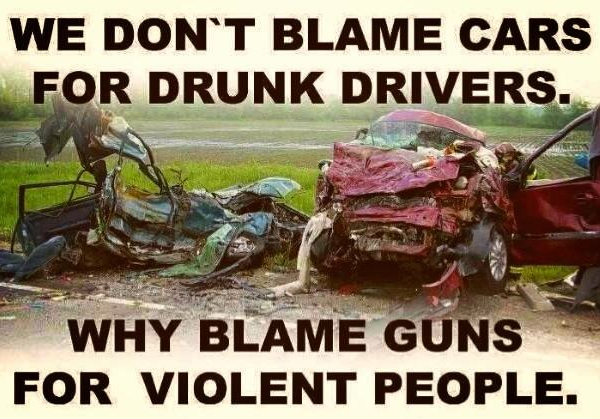 Operating a motor vehicle and owning a firearm both bear heavy personal responsibility in terms of safety. It is unfortunate that we have lessened the personal responsibility required to drive a car. Before there were backup alarms and cameras, there were mirrors. Before there were tire pressure monitoring systems, there were tire pressure gauges. We have rewarded those too lazy to bear responsibility for maintaining and operating their vehicles. We should not do the same with firearms. No responsible firearm owner would trust some “safer gun gizmo”, because he will always perform the required manual safety checks and store his guns in a secure manner. The vast majority of the many millions of gun owners in this country take this personal responsibility very seriously. Let’s not marginalize it. Thank you for your article, as it has helped me to understand the thought processes of those seeking to control or ban things they know little about.